I realized this morning that almost every room in the house now has some sort of baby containment unit. There's her pack and play in the living/dining room, her swing in the kitchen, her saucer in the computer room, her bassinet in our room, and her full sized crib we plan to move her into when she's finally sleeping through the night in her sister's room. Sometime I feel guilty moving her from one baby storage unit to the next, but she's getting really heavy, and it isn't very long into holding her that my arms start to feel it. Anyway, today I thought I'd share another pattern. This one is really a variation of my Mermaid pattern, but I'll admit I was inspired by this pin of a Rapunzel doll. The pattern is for sale but I'm cheap and I couldn't help thinking I could make something close enough to please my daughter but original enough that I wouldn't feel like I was stealing. However, I should've known better than to make plans without consulting Coryn. She came over when the doll was partway done and asked, "Is that a Ballerina for me?" Of course, it wasn't supposed to be a ballerina, but since that was apparently what she wanted, I scuttled Rapunzel and made Ballerina Rapunzel (she still has the long hair. I'd already finished that part, though Coryn asked me to take out the braid.) . This is her after her braid was de-braided. The first portion of this pattern is identical to my mermaid pattern so please check out that pattern as well if you need photos for clarification on the process of creating the head, upper torso, and hair. Also, as always, I love to see you check out my Etsy shop (Critters for Coryn), even if you aren't in the mood to buy. 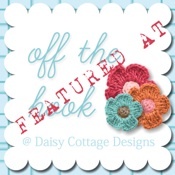 Consider pinning my blog, etsy shop, or following me on Pinterest. as well as additional scrap yarn for embroidering the eyes and mouth. Any yarn type or hook size works. It is helpful to have an embroidery/yarn needle to piece her together as well as for her facial features. You will also need some form of stuffing material (as I usually do with small projects, I chose to stuff her with yarn scraps). Here is where I suggest stopping to attach the hair. I provide picture instructions for how to make the doll hair in my mermaid pattern post. If you choose to make your doll Rapunzel-esque, you'll want to simply make long strands of yarn, enough to cover the doll's head, sew them on along the top of her head, and then braid them. This is the braid I originally made. At my daughter's request it was undone later. Finish stuffing and fasten off. In the background, Detective Beckett gives her approval. The next step is her legs and "ballet slippers." If you bend her foot like this it looks a little more leg like. Otherwise, just pretend she's dancing on her toes. She's almost ready to dance. R1- 4 sc in second chain from hook. It occurs to me I may have gone overboard with the pictures this time. If you wanted to say she was in a leotard, you could call her done at this point, but I wanted mine to have a skirt. Skirt, in dress color or if you wanted to throw in another color at this point (ie pink skirt, white dress or whatever combination you like), go for it. Fasten off leaving a long tail for sewing. Wrap the skirt around the doll's waist and sew it together. A few tacking stitches should be enough to hold it on. The finished skirt, waiting to be sewed in place. stitching the two ends of the skirt together. And here is Rapunzel Ballerina! I hope you get a chance to make this little doll. Please comment if you have any questions and feel free to pin and share my blog. I would be honored. My email is hlgstrider at gmail, if you want to add it so it doesn't get spam filtered. I hope it turns out well for you. Thanks for stopping by! I have been struggling with a Christmas gift for my husband's grand niece... She's almost 2 & I didn't want to just buy her something. I think the mermaid & ballerina will be absolutely perfect for her! The pictures make the dolls look a little small, just the right size for her little hands! I hope you get to make them and she likes them. One thing I love about this pattern is you can personalize it to the little girl's tastes by changing the color of yarn you use to match the little girl or her favorite Disney princess. I sometimes let my daughter pick the colors for me, but she is creative so we end up with blue haired dolls.